Bryan Carlson, FASLA is an internationally known and respected landscape architect, urban designer and planner. He brings to Aventur a passion for design and experience gained from cultures and projects worldwide. Mr. Carlson was Principal and Senior Vice President at Ellerbe Becket where he worked for over 20 years providing master planning and site design services to clients in higher education, health care, corporate, commercial governmental and residential markets. He also served as Managing Director of the firm’s Tokyo Office from 1994 - 2000, executing a number of higher education projects in Japan. Bryan was a major contributor to the Ellerbe Becket design team on Kingdom Center, an iconic mixed-use tower well known in the Middle East. 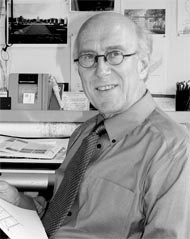 In 1998 Bryan Carlson became a Fellow in the American Society of Landscape Architects, an acknowledgement by his peers of demonstrated significant quality and significant impact on the public for planning and design of built work. Mr. Carlson’s recent work includes education projects in Japan and resort communities in Costa Rica. Domestically Bryan works with the Minnesota Landscape Arboretum, University of Minnesota, Shattuck St Mary’s School and Wells Fargo. In the past few years, Bryan Carlson has created award winning civic spaces and monuments including Rochester Peace Plaza, Annenberg Plaza, and WWII Veterans Memorial at the Minnesota State Capitol.